I don't often embed YouTube videos on Bruggietales, but these two relate to our thoughts behind homeschooling. They aren't short but are worth watching. The two above videos basically provide statistics about the changing world around us, both demographically (age and composition of the people) and educationally (exposure to technology and changing requirements). We are trying to teach our children that learning is an ongoing thing and concentrating very strongly on the basics of reading, writing, comprehension, mathematics and history, but also on a structure within all this belongs. Raw knowledge is either irrelevant or dangerous if it is not provided within a context that matches reality. Some of the statistics assume continual growth at the same rates while their basis is that everything changes quickly. So we are asked to accept two contradictory premises: The world is changing quickly AND these changes will keep happening the same way. I recognise that my job (and this blog!) could not have existed even 10 years ago. So predicting 10 years ahead is a risky business. The only way we can see to prepare ourselves and our children is to give them a broad education with a strong moral compass so they can make informed decisions. When I see predictions of the future I remember the opening chapter in G.K. Chjesterton's book "The Napoleon of Notting Hill" entitled: "Introductory Remarks on the Art of Prophecy". It is worth reading in full, but in summary Chesterton's premise is that the human race in general plays the game of "Cheat the Prophet" whereby the "Clever people" all predict a myriad of possible futures - all contradictory - and insist that non believers had better change or else. Then the people eventually bury the "clever people" in due course and the world develops into something no one actually predicted. So in the end, we are called to use our talents wisely, know, love and serve God in this world and love our neighbours as ourselves. Last Saturday I took the boys, one of their friends and Ariel shopping. The main reason was to top up the pantry, but bonus side trips to the Library and Hardware store were why the children wanted to come. James was very happy when I found him a book on siege weapons. The book not only showed examples of sieges through the ages, but also the tactics used and methods of construction. His Lego creations have taken on a whole new flavour! At the hardware store we went to the wood/lumber section and I asked the assistant, "I need some wood for swords." He smiled and looked at the boys. I added, "Yeah. Good wood. Pine just doesn't last past a few good whacks so I need some sort of hardwood." He understood and showed us the hardwood timber flooring and we found a number of 1.2-1.5m (4 to 5 ft) lengths. The boys then noticed a range of poles. The assistant said to me confidentially, "Broom handles will be cheaper than these rods, especially considering how they'll be used." "Agreed!" I replied and went inside and purchased several broom handles. At the checkout I placed the wood and broom handles on the counter saying, "Just these swords and spears thanks." She looked at the products and me and smiled. By Monday, Lana's Dad had made Peter's sword and had already rounded the ends of the broom handles on the Saturday we bought them. Dad had been to the doctors on Tuesday and was having a relaxing time on Wednesday morning. He had told the boys he would finish the swords after lunch. The boys lurked nearby and waited. And waited. When Dad emerged from his place, Peter said, "Finally!" You may be thinking, "Hang on. Why would Peter say 'Finally!' if his sword was already made?" Well, what is the point of having a sword if your brothers don't have theirs? Who would you fight with? Time really is subjective. Especially waiting for your new sword to be made! 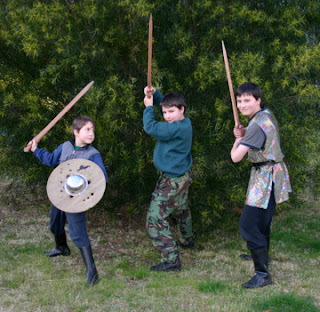 When I returned home from work on Thursday, the boys rushed to show me their new swords. James happily told me, "We whack these really hard and they don't even dint!" It has been two weeks since Ariel started working full time at the local village store. She had been working there for two hours each morning sorting the mail and assisting with the morning duties when a marvellous opportunity arose. The local TAFE (similar to Community College) offers a Retail training course - which is like an apprenticeship - for young people working in the retail industry. So Ariel is effectively working as an apprentice at a great place only a five minute walk from home. Naturally, she has been pretty tired, as all adults can remember when they first started working. 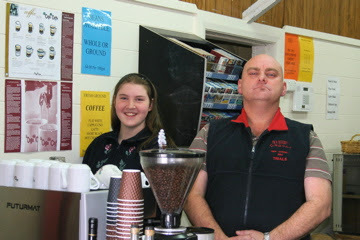 Ariel is doing very well and the owner, Mr J, is getting her involved in all aspects of the business. Mr J is very clever in getting Ariel involved even when she tries a number of stratagems to hopefully avoid some of the responsibility. One day Ariel informed Mr J that some more pies were needed. He suggested Ariel call the supplier, but she "didn't get around to it". Later, she once more told him more pies were needed. So he rang the pie supplier and said to the lady, "Ariel is an apprentice here and she is going to order some pies but she is a little bit shy." While he was talking, Ariel was saying "NO NO NO" in the background. He then said to the lady, "Here she is," and passed the phone to Ariel. Ariel took the phone and she could hear the lady laughing. Ariel finally said softly, "Hello" and the lady replied, "I hear you are going to order some pies?" Ariel then ordered the pies. Ariel is pretty sure the lady had heard her in the background saying No. So why is Ariel working? I'm sure Ariel will tell her children that it is because "Dad said so". I tell my children I went into accounting because Mum said so. Good thing she did tell me as I didn't know what I wanted to do and accounting worked out to be just right! Ariel didn't know what she wanted to do and she was ready to get more experience by working and studying at the same time. The opportunity was too good to turn away and we are all pretty happy with how it is going. When I consider that midshipmen commanded captured ships at 13 and 14 years of age, I'm sure our children should be able to shoulder more responsibility than seems to be the current norm of 18 to 24. The two youngest girls like to go for a walk to the Village Store when we supply them with the biscuits we sell and there is always a chance that Mr J will give them a lolly or two. On the way home Clare wanted to play "I Spy" with colours. I answered, "Roses' clothes." This was not a surprising answer as it is Winter and most things are brown or green. "I spy little eye purple." "Clares' clothes." "Yes"
"Ok. I spy orange." There was only one other coloured thing anywhere around a large tractor/digging machine. We continued playing with Clare walking beside me and Rose skipping /dancing a little way in front. Clare and I were trying to be creative taking turns with Rose. We used blue - sky, green - leaves, white - a chicken we just passed, red - car, yellow - the lollypop she just hid behind her back moments before. For every turn that Rose chose a colour it was "I spy little eye Pink" "I know, your clothes." "Yes" followed by a little giggle and a bit of a dance. She seemed to be off in her own little world swerving and dancing along the dirt lane, but she knew when it was her turn and she announced each time "I spy little eye Pink" happy to feel apart of the game and have her turn. It was a very pleasant stroll home with the girls enjoying the afternoon and their company. Homespun Juggling is a family blog which has contains a funny family based comic series. The above comic is the latest example. I have been working quite a lot lately, including Saturdays. On a flight home from Melbourne I noticed in the in-flight magazine and mention of the Australian War Museum in Canberra (www.awm.gov.au). "Good Idea!" I thought, "We're going." and I picked up a copy of the magazine to remind me. The Australian War Museum is free to enter, there are lots of exhibits, plenty of museum staff in red coats providing tours or available to answer questions and we had plenty of room to park our bus. The children really enjoyed to "Discovery Zone". This is a section with five areas covering different facets of wars in which Australia participated. There was a mocked up helicopter from Vietnam,, where the children could get in the various seats, put on headphones, move lots of levers and buttons and even dress up. Next was "Cold War" with a mock up a submarine where the children could look out the periscope, lay in the small bunks. There was a picture of two ships through the periscope, moving through a storm. 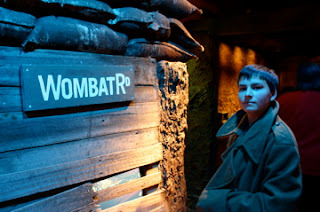 Next, and most favourite, was the WWI trenches. 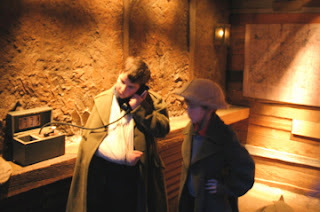 The children were able to dress up and crawl around the trenches and bunkers. James felt he looked the part with his broken elbow. The other two sections was bridge building in Vietnam and an airplane observation post in WWII. Another visual feast was based around the Lancaster Bomber "G for George". A light show, voice over and video footage grahically illustrated one of the bombing runs in which the bomber went on a raid on 31 May, 1945. Another show centred around the invasion of Sydney harbour by 3 Japanese mini submarines. The mini-subs were launched by a main submarine outside the harbour and these little 2 man jobs sneaked in to destroy shipping. I knew the subs had invaded and were all destroyed, but I didn't know that one of the subs had hit one of the US ships, killing 112 servicemen. All in all, 3 hours went by very quickly. It was a fun day spent as a family.